• a small travel size bottle of Charlie’s Soap; all-purpose liquid soap, and unscented. • looking right at you; a Sheep Needle Gauge - with US sizes on one side and mm on the other. Sizes runs from a gigantic US#19, to a minuscule US#000000. • Puppy Snips are for fun, and you can chain them onto the zipper. They work beautifully for all practical purposes. • Nirvana Scissors are surgical quality steel, and are recommended for serious snipping, like steeks - for which you need scissors that cut precisely, right down to the tips. • our favorite stitch-markers: Coil-less Pins, are safety pins without the coil at the bend, to avoid tangles. One bag each of large (silver--about 35 pins) and small (gold-about 65 pins). Place a pin directly into the Important Stitch, and you needn’t move it every round or row. • vitally important Sewing-Up Needles. We include 3 of them in your bag: one blunt for weaving, one sharp for darning in, and one bent-tip-blunt which gives you a head start when weaving. Artists need their tools! 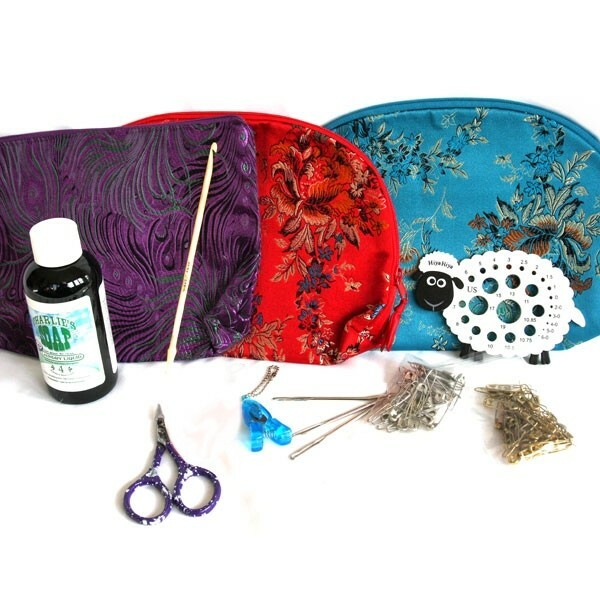 Here is a special offer and the perfect gift for yourself or another knitter. (Discounted 10% for purchasing items as a bundle.) • a bright Brocade Zippered Tool Bag containing an assortment of essential Hand-Knitter’s Tools: • a hand carved Crochet Hook from India. A mid-range size that will work for all occasions (a dropped-stitch, Phoney Seam, or a Steek and more) • a small travel size bottle of Charlie’s Soap; all-purpose liquid soap, and unscented. • looking right at you; a Sheep Needle Gauge - with US sizes on one side and mm on the other. Sizes runs from a gigantic US#19, to a minuscule US#000000. • Yes, there are two different types of scissors included: • Puppy Snips are for fun, and you can chain them onto the zipper. They work beautifully for all practical purposes. • Nirvana Scissors are surgical quality steel, and are recommended for serious snipping, like steeks - for which you need scissors that cut precisely, right down to the tips. • our favorite stitch-markers: Coil-less Pins, are safety pins without the coil at the bend, to avoid tangles. One bag each of large (silver--about 35 pins) and small (gold-about 65 pins). Place a pin directly into the Important Stitch, and you needn’t move it every round or row. • vitally important Sewing-Up Needles. We include 3 of them in your bag: one blunt for weaving, one sharp for darning in, and one bent-tip-blunt which gives you a head start when weaving.